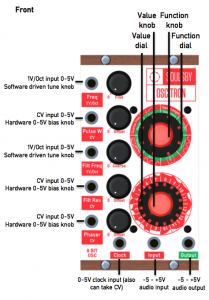 Eurorack has been nicknamed ‘Eurocrack’… and for good reason. It’s certainly addictive! 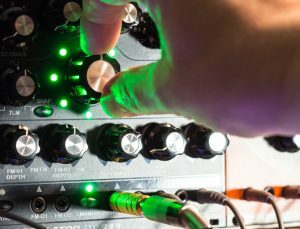 As any enlightened Eurorack small-format modular system user would surely say: you can never have enough modules that influence levels, be that for audio signals or control voltages. 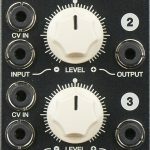 VERMONA’s quadroPOL polarizing mixer / ringmodulator helps fill that void — or, indeed, any empty Eurorack rack-space (assuming that potential purchasers have 10 HP to spare in their system) — as a four-channel polarizer module, capable of attenuating any incoming signal, in-phase or out of phase. 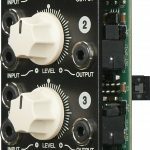 Putting it ahead of the Eurorack pack, the way that each of those four channels work is one of its most distinguishing features. Fortunately, instead of only having one dedicated zero-point, it has a ‘dead-zone’ where the input signal will be completely suppressed, so users can easily locate the off position — even without a centre-click — while simultaneously being able to create extremely sensitive level increases. Further flexibility abounds as the quadroPOL polarizing mixer / ringmodulator realises a number of other outstanding features. Firstly, any channel’s OUTPUT signal is optionally forwarded to the next one, allowing the quadroPOL polarizing mixer / ringmodulator to be used as a mixer module, as implied by its full appellation; as such, users can sum up to four signals. Secondly, the quadroPOL polarizing mixer / ringmodulator can also be controlled via control voltages, with each channel boasting a CV IN alongside its INPUT; so, setting the level manually apart, users can also use each channel as a VCA (Voltage-Controlled Amplifier)… and — Eurorack being ‘Eurocrack’ — you can never have enough VCAs in a modular system, now, can you? Yet more functionality comes courtesy of the fact that the quadroPOL polarizing mixer / ringmodulator has one four-quadrant multiplier per channel, allowing the module to also act as a ring modulator without any compromises — in fact, four ring modulators! Mind the (10 HP-wide) gap. As flexible as it is functional, then, owners of any Eurorack small-format modular system should surely consider adding a quadroPOL polarizing mixer / ringmodulator to their setup. After all, once you’ve got your hands on one, it’s hard to live without it. Indeed, once you’ve got your hands on one, you might need to satisfy your addiction with another! Shipping now, the quadroPOL polarizing mixer / ringmodulator is available to purchase through VERMONA’s growing global network of dealers (http://www.vermona.com/en/dealer/) with an RRP of €269.00 EUR (Europe) and $309.00 USD (USA). This episode I was fortunate to have John Bowen on the show. A staple in the synthesizer community for roughly 40 years, John has been instrumental in many of the legendary synths of our time. 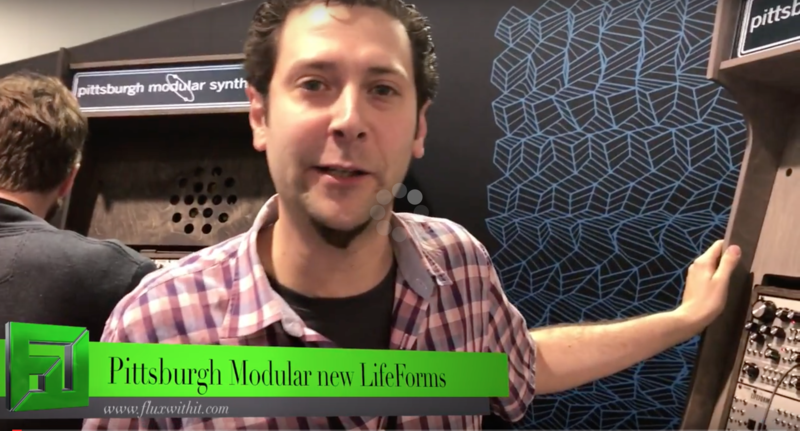 Join us as we walk through a piece of synth history and cap it off with a discussion of his amazing Solaris synthesizer. Hex Inverter the mind behind the Mutant Drums series of Eurorack Modules returns to NAMM 2017 with a new filter, Rim shot and wild noise source oscillator. Winston from Balcones Whiskey steps in to assist with this coverage so big thanks to Winston and the crew at Balcones whiskey. 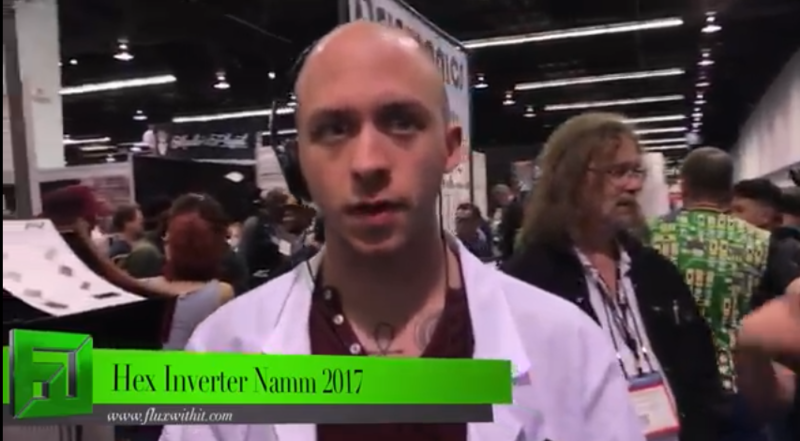 New Synthesizer Modules from Hex inverter at Namm 2017! A dictionary definition of swarm typically reads: a large number of things… or oscillators, in the case of Radikal Technologies’ radical RT-311 SWARM OSCILLATOR, which, when switched to its highest SWARM setting, sees a maximum of 16 oscillator ‘clones’ running simultaneously. Something that stands out from the sound of the (ever-expanding Eurorack modular) crowd — to (partially) paraphrase the early-Eighties British breakthrough hit from synth-pop pioneers The Human League (themselves no strangers to the small-format modular system popularised by fellow German developers Doepfer Musikelektronik) — and surely something to behold? But building swarms of oscillator clones using both (OSCILLATOR 1 andOSCILLATOR 2) banks’ specialised set of TUNE, OCTAVES, DENSITY, SPREAD, and DETUNE controls to create pitched musical intervals, chords, clusters, or fat detunes does not necessarily mean that all 16 of those clones have to sound simultaneously. 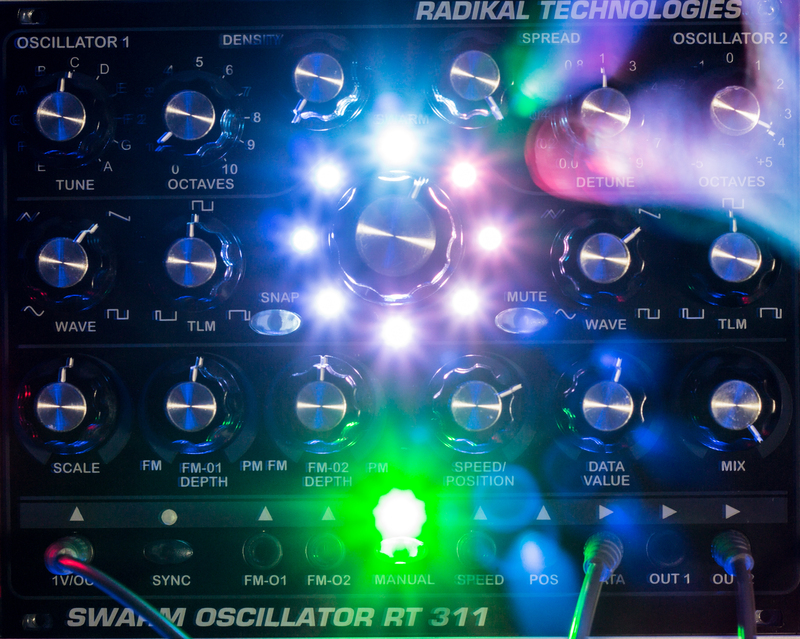 Switched into (its default startup) Manual-Mode of operation, the RT-311 SWARM OSCILLATOR can function much like any other Eurorack-compatible all-analogue oscillator out there with OSCILLATOR 1 and OSCILLATOR 2 respectively appearing at the two (OUT 1 and OUT 2) outputs as sound sources for further manipulation elsewhere — using Radikal Technologies’ own RT-451 DUAL MULTIMODE FILTER module, for instance. In this scenario, the sound of the RT-311 SWARM OSCILLATOR module matches exactly what would be expected from the potentiometer-controlled parameter positions on its 32 HP (Horizontal Pitch) sized front panel; putting yet more controls at adventurous users’ fingertips, both banks of oscillators feature WAVE controls for smooth transitions between waveforms and TLM (Timelinearity Modulation), a variation of pulse-width modulation — known from Radikal Technologies’ SPECTRALIS 2 ANALOG SYNTHESIZER/ BEATMATRIX/FILTERBANK desktop hybrid — that can be applied to all waveforms, while exponential FM (Frequency Modulation) and linear FM modulation or PM (Phase Modulation) are also available alongside oscillator synchronisation. Pitch is, of course, controlled by the (calibrated) 1V/OCT input (which can be quantised so that only pitches of a certain tone sequence or scale are output). Other operational modes make more radical results really shine through, though. Switching Snapshot-Mode into play permits the RT-311 SWARM OSCILLATOR to store up to eight memory setups, each with eight snapshots, saving all oscillator settings and memorising them even after whatever Eurorack small-format modular synth system is playing host to the module has been powered down! Such snapshots are assigned to one of eight positions accessible via the ‘big knob’ dominating the RT-311 SWARM OSCILLATOR’s front panel. Put it into Interpolator-Mode and everything (literally) revolves around the cyclic traversal of those snapshots, smoothly crossfading from one to the next with transitions taken care of via voltage control, an internal LFO (Low Frequency Oscillator), or the big knob itself — either way, the surrounding eight LEDs (Light Emitting Diodes) illuminate accordingly in user-chosen colours, helpfully highlighting which snapshot is playing at any given time. To make room for an RT-311 SWARM OSCILLATOR in any Eurorack small-format modular system means making more sound colours available to the sophisticated synthesist… Radikal by name, radical by nature, now a swarm of oscillators need not take up too much valuable rack space, so why not add one (or more) modules to your setup today to start puttingRadikal Technologies’ latest DSP-driven design through its unique-sounding paces? 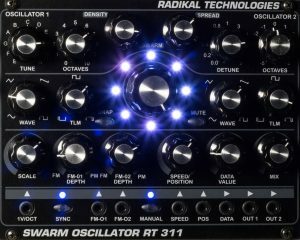 Now shipping, the RT-311 SWARM OSCILLATOR is available for purchase from Radikal Technologies stockists at an MSRP of €598.00 EUR (in Europe) and $659.00 USD (in the US). Soulsby Oscitron is listed as a 8 bit oscillator, but I think that is underselling what this thing really is.